A Flower Share is like a subscription of fresh flowers. Ours works like a CSA (Community Supported Agriculture). CSAs are prepaid purchases of farm products. These support the farmer in early spring by spreading out income and allowing them to support more employees during the lean months. In turn you receive beautiful local products during the growing season. You will receive 4 weeks of fresh full mixed flower bouquets directly from our farm. Each week we choose an interesting mix of the best flowers for that week. Want to see out flower list? Flowers by the month. You will receive and introduction with details, as well as an email reminder each week before pickup. Shady Grove Gardens produces 5 acres of cultivated flowers, several hundred varieties of annuals, perennials, evergreens and flowering shrubs. Brent and Susan have 40 years combined flower and design experience. Wednesday 5-7 PM -Bouquet pickups at our Zionville nursery location. Thursday 5-7 PM -Bucket and Dahlia bouquets (August & September) are at our Zionville nursery location. If you prefer a Boone pickup, please order through the High Country Food Hub, for a Wednesday afternoon pickup. 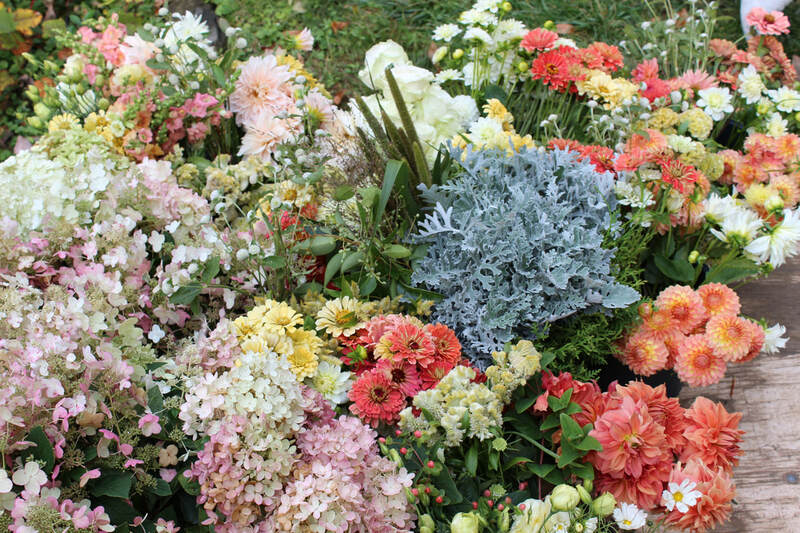 August or September, 4 Weeks of fifteen- twenty beautiful mixed dahlias, @88.00/4 weeks pickup is at our nursery in Zionville, NC 10 miles from Boone. These are all dahlia bouquets. Four weeks of these fun mixed buckets of flowers are 70 stems of our best flowers for you to arrange. We supply a mixture of focal, filler and line flowers each week. These are the same volume as our bridal DIY buckets @ the discounted price of $70 per bucket or $280 total. Pickup Thursday@ our nursery in Zionville. Choose the month or months you'd like these on our storefront. A large mixed bouquet of our finest flowers, ready for the trip home. Flowers are delivered the 1st four weeks of each summer month, May -September. For months with 5 weeks we will take a 1 week break. You may order more than one month at a time. Wednesday 5-7PM at our Zionville nursery. 4 weeks of May flowers @ $120 for our special bulbs and spring flower arrangements. These bouquets are 20-25 stem flower arrangements, so you may choose to make smaller bouquets with them. Each of these bouquets will include a careful mixture of filler and line flowers, greenery and focal flowers such as dahlias and lisianthus. If you are looking for more than one bouquet per week, please place two separate orders or call us.